Big weekend: a multi-national play in four parts. Technically, there were two Americans, one French woman, and five Italians present, but since the latter outnumber the former two, we’re giving them Act I. In any case, it was truly a lesson in the differences between French, Italian and American ways of life. First, tempo. Tempo when walking, that is. Americans, I find, tend to be the speediest bipeds I’ve met, especially those from NYC. But even Virginian walkers will lap a Frenchman every so often. Parisians come second in the speed-walking contest and Italians…well, they’re so leisurely in their pace the tortoise lapped them not once, but thrice. Second, expatriates. I asked one of the Italians his thoughts on living in Paris, versus his time in Italy. One thing he noted, that many texts on French culture will support, is that the French aren’t exactly friendly. It takes a while to squeeze yourself into a French friend-circle, and even then, things like swinging by the Jones’ on your way home aren’t done: you really should call and schedule that visit. Third, jazz! The band was apparently part Italian, and the concert was in the 10th (right around the corner from the Indian district) and we ate Turkish food right before, so it was a right multi-cultural experience. The guitar player looked like Bret (from Flight of the Conchords) and the other American and I couldn’t help but snicker every time we caught a glimpse of his shaggy hair. The music itself was smooth, enjoyable, a bit of flute, some sax, percussion, and a mellow bass. We ended the night with a stop at Rue Mouffetard, for some mulled wine and late night conversation at La Contrescarpe, whose cozy decor didn’t quite match the thumping techno music played over the speakers. On Saturday I took some time to visit another museum, le Petit Palais, which was built for the 1900 world fair and is the little sibling of the better-known Grand Palais. The latter gets to host big events like the Paris Fashion Week. The former houses a small but nice collection of paintings, sculpture and decorative arts, has impressive architecture itself, and is free, to everyone. 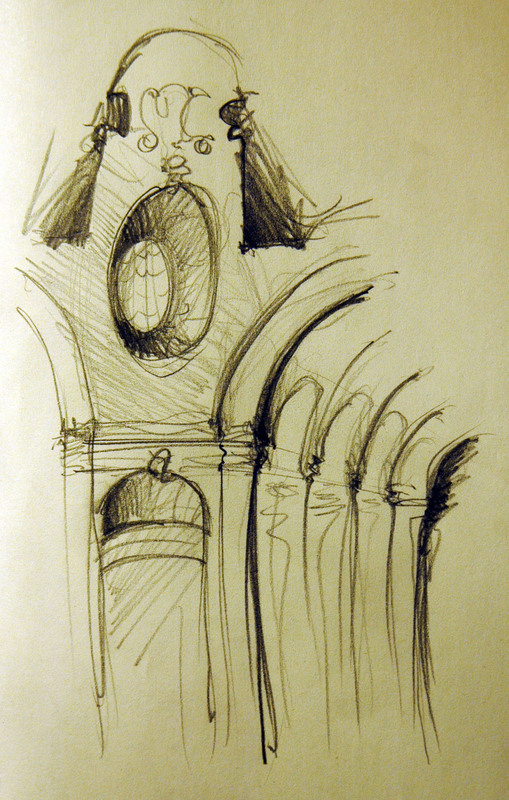 After wandering through the collection for an hour or so, I took some time to sketch (as I promised I would try and do more often). Detail from the entry dome at the Petit Palais. 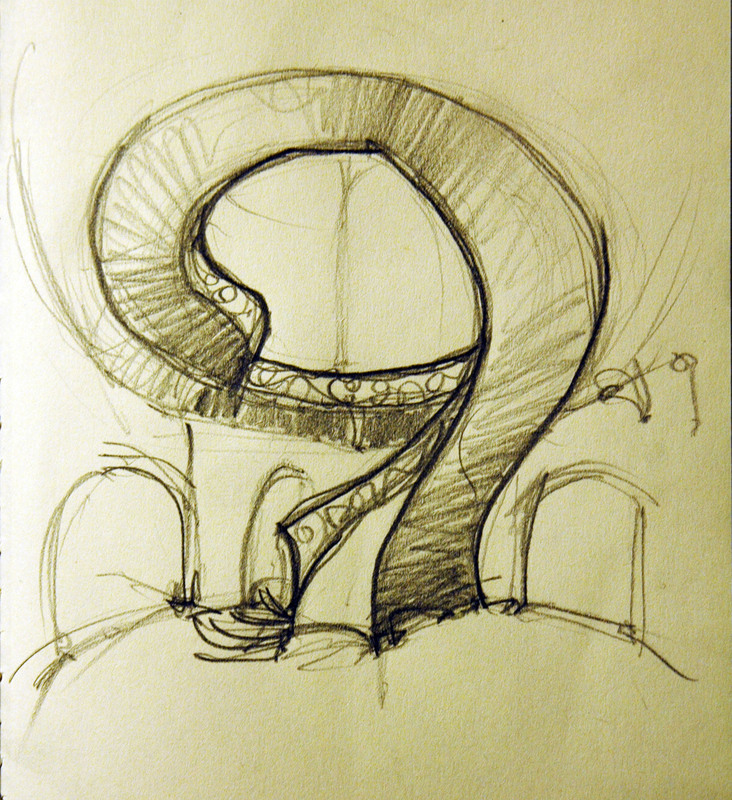 View of its famous spiral stair from below. That evening, I went to see a movie with one of my French students, in French. I’d been complaining about how little French I actually spoke, since most of my courses were English courses and my friends were all Americans…and that I wanted to go see a French film but was worried I wouldn’t understand a thing! So she suggested we go together and discuss the movie over a drink, which is exactly what we did. After a bit of window shopping along the Champs-Elysées (window shopping because I’m not sure I can afford to spend €200, also known as 1/4 my paycheck, on a 3″x4″ LV wallet), I met her at the UGC Charles V. We then wandered through the Christmas markets, grabbed a cup of vin chaud (to keep both our insides and our shivering fingers warm), and caught a glimpse of the light show at the Eiffel tower. The film is about a young boy, Oscar, who has terminal cancer. The "dame rose" is the only woman with whom he agrees to speak during his last week. Yes, it's a sad movie. Yes, I teared up (more than once). And yes, I understood most of it, even without subtitles (though when they spoke really fast, it was from visual clues, and a slowed-down replay in my own mind). Yesterday, a Tech classmate of mine who’s doing the same program as I am, but teaching near Bordeaux, came up to Paris. She had a flight back to the US this morning, so last evening the two of us met up with another American friend of hers, wandered around the Latin Quarter, did some window shopping, and had a generally good time comparing notes on living in France, being American (i.e. not French) and general sillyness. I had my first fondue in France, both cheese and meat, and my first raclette, and chased that down with a delicious crêpe nutella banane and a mug of caramel tea. We dropped my friend back at her hotel which was a bit closer to the airport – and that meant taking the RER B. Like usual, there were issues with the train, we had a random train-change because of technical errors, but made it to the hotel and back just fine. Encore: The French Lesson, Reprised. This afternoon I had an incredible pasta lunch at Pizza Positano, near Odéon, with a French girl I know from studying at Fontainebleau. We then wandered around the Marais, catching up on our adventures and ducking into an architectural exhibition or two, and making me faire travailler (work on) my French. It turned out to be a 4-hour French-only conversation, the most French I’ve spoken in one-go since getting here. I was pretty tired by the end of it all. As a side note, we were tempted by a free taster at Starbucks, and wound up going in and ordering the real thing – whoever comes up with their lattes is an incredible genius: drinking a noisette caramel (hazelnut caramel) latte is getting pretty close to heaven. Green, like Kermit and grass. 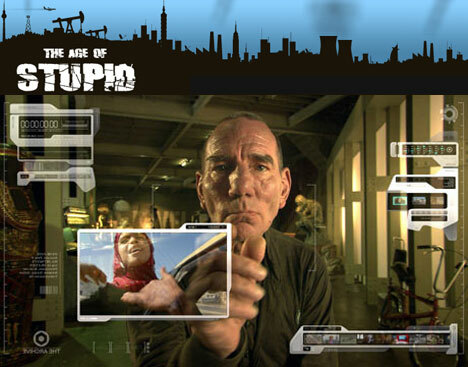 I just returned from a screening of The Age of Stupid, part of the Festival International du Film d’environnement, a week-ish-long event in Paris (for you English-speakers, there’s a little British flag in the top right that translates the page to anglais). I haven’t spent much time on this blog writing about “serious” topics, like the environment or sustainability. That’s not necessarily because I don’t think about them, because I do, and certainly not because I know nothing about them, because 50% of my courses addressed sustainability at one point or another. But it just hasn’t come up recently. That is, until now. I saw an article in one of the Metro issues this week about the affair, and thought I’d give it a go. I was particularly interested because I saw they were screening Food, Inc., a film I’ve been wanting to see for a while. More about that film in a minute, first I’d like to mention that they have screened (rather, will have screened) 100+ films during this event, documentaries and fiction, feature-length and shorts, all of which address our present and future as a species and a planet. Basically, there’s something for everyone, even an animated film for the 4-8 year-old crowd. Start ’em early. I saw two of the films aired today, because they seemed the most interesting and happened to best fit my schedule (er, I wanted time to actually work on my grad school stuff today?). 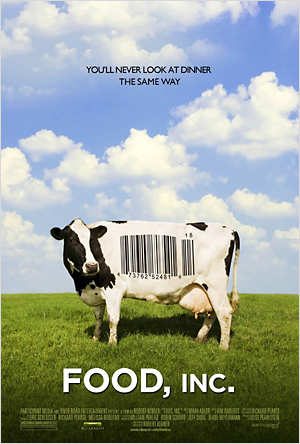 The first was Food, Inc.
A smart farmer and giant corporations that mysteriously keep mum. What's not to like? Story-telling: the documentary interviews characters that are memorable and presents their stories in a compelling way. One of the individuals, a farmer who grows free-range everything, from chickens to cows to pigs, and has an impressive vocabulary, is interviewed as he slaughters chickens and packages them for sale. It’s all done in an open tent, and the farmer notes the irony that conducting this work in fresh air is considered dangerous by the FDA as it can lead to contamination of meat (through air-borne particles). The film then goes on to remind the viewer of the previous interviewees, a chicken farmer who wore a mask to wade through a throng of hobbling hens to gather the ones that had died during the night. Art direction: the film is divided into chapters, of sorts, with catchy headings (that I can’t remember, but I remember they were catchy at the time) done in an artful way. Oh, here’s an example: when talking about a veil concealing the source our food, the heading first reads “evil” then rearranges itself to “veil.” Subliminal? Not so much. Point taken, though. Art direction 2: there are bits of the film that are animated, that read almost like graphics from WIRED, reworked in 3D and talking about food consumption rather than the next big gadget. I thought they did a good job integrating these animated bits into the overall visual and narrative fabric of the film. I even got to ask a question. I was curious, since the film included documentary footage from around the world (Mumbai, New Orleans, the Alps, England, Africa) and spoke specifically about the large amount of emissions made by the airline industry, how the crew kept their carbon footprint low while filming. The producer answered my question, saying they commuted using trains as much as possible (flying as little as possible), used eco-friendly supplies in the office, were all vegetarian, etc. For the film’s premiere, they hosted a multi-national satellite event, based in London. Celebrities arrived on bike or in electric cars and walked down a “green carpet” to the screening area, where the projections were all powered by renewable resources. It was the largest film premiere in history, and it produced only 1% of the emissions you’d expect from a Hollywood-sized premiere. Their approach to marketing and production is quite interesting, too. Each crew member (104 total) took a pay-cut in order to invest themselves in the film, thus earning a profit as the film earns profit, and not limiting the film’s circulation through contractual means. To further increase circulation opportunities, the film is available for private/public screenings: that is, whoever you are, you can have a screening whenever and where-ever you want, and keep your profits. Of course, you pay a base fee for the rights to screen the film…but it’s for a good cause? If you’re interested, check it out: http://www.indiescreenings.net/. Well, that’s my “important topic” for the month. Don’t expect the next blog entry to be so serious – I’ve got to tell you about my afternoon with Bob l’Eponge. P.S. Did I mention this whole festival was free, one of many free film festivals in Paris over the course of the year, in fact? I love it when a government puts money towards cultural enrichment and public education. Of course, the people that need to be convinced about the importance of sustaining our environment probably didn’t come.